7 Heavenly Chards is an actual bottle of wine is available from Lodi Vineyards. Chardonnay Justice, Balanced and true, Resurgence of Life brought anew. (Grape w/ Scale) Chardonnays Temperance, Patient and Mild, Riding the storms and taming the wilds. (Grape Taming Horse) Chardonnays Prudence, Cautious and wise, Embracing the earth, arms to skies. (Grape holding earth) Chardonnays Faith, the intangible shield, Solid as stone, refusing to yield. Grape W/ shield) Chardonnays Endurance, The river within rising the Flow, again and again. (Grape shooting up under Faith) Chardonnays Hope, a spark to ignite, An unquenchable flame, a beacon of light. (Grape W/ lantern) Chardonnays Love, reigning supreme, Uniting them in all in this heavenly Dream. 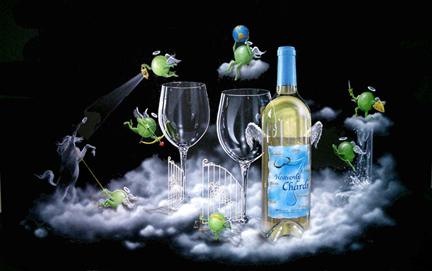 (Cupid Grape) 7 Heavenly Chards is the 2nd piece in a 3 part series. The 1st piece, 7 Deadly Sins, is a sold out edition.